Extracting knowledge from data is, in most cases, not restricted to the analysis itself but accompanied by preparation and post-processing steps. Handling data coming directly from the source, e.g. a sensor, often requires preconditioning like parsing and removing irrelevant information before data mining algorithms can be applied to analyze the data. Stand-alone data mining frameworks in general do not provide such components since they require a specified input data format. Furthermore, they are often restricted to the available algorithms or a rapid integration of new algorithms for the purpose of quick testing is not possible. To address this shortcoming, we present the data analysis framework Knowing, which is easily extendible with additional algorithms by using an OSGi compliant architecture. In this demonstration, we apply the Knowing framework to a medical monitoring system recording physical activity. We use the data of 3D accelerometers to detect activities and perform data mining techniques and motion detection to classify and evaluate the quality and amount of physical activities. In the presented use case, patients and physicians can analyze the daily activity processes and perform long term data analysis by using an aggregated view of the results of the data mining process. Developers can integrate and evaluate newly developed algorithms and methods for data mining on the recorded database. More informations will be published at the official publication site at the LMU. OpenStreetMap creates and provides free geographic data such as street maps to anyone who wants them. The project was started because most maps you think of as free actually have legal or technical restrictions on their use, holding back people from using them in creative, productive, or unexpected ways. The OpenStreetMap approach is comparable to Wikipedia where everyone can contribute content. In openStreetMap, registered users can edit the map directly by using different editors or indirectly by providing ground truth data in terms of GPS tracks following pathes or roads. A recent study shows, that the difference between OpenStreetMap’s street network coverage for car navigation in Germany and a comparable proprietary dataset was only 9% in June 2011. In 2010, Yihua Chen and John Krumm have published a paper at ACM GIS about “Probabilistic Modeling of Traffic Lanes from GPS Traces“. Chen and Krum apply Gaussian micture Models (GMM) on a data set of 55 shuttle vehicles driving between the Microsoft corporate buildings in the Seattle area. The vehicles were tracked for an average of 12.7 days resulting in about 20 million GPS points. By applying their algorithm to this data, they were able to infer lane structures from the given GPS tracks. Adding and validating lane attributes completely manually is a rather tedious task for humans – especially in cases of data sets like OpenStreetMap. Therefore it should be evaluated if the proposed algorithm could be applied to OpenStreetMap data in order to infer and/or validate lane attributes on existing data in an automatic or semiautomatic way. In Medical Image Computing and Computer-Assisted Intervention (MICCAI), Toronto, Canada, 2011. In Proceedings of the IEEE International Conference on Image Processing (ICIP), Brussels, Belgium, 2011. The work is a result of a collaboration with Michael Weiler. 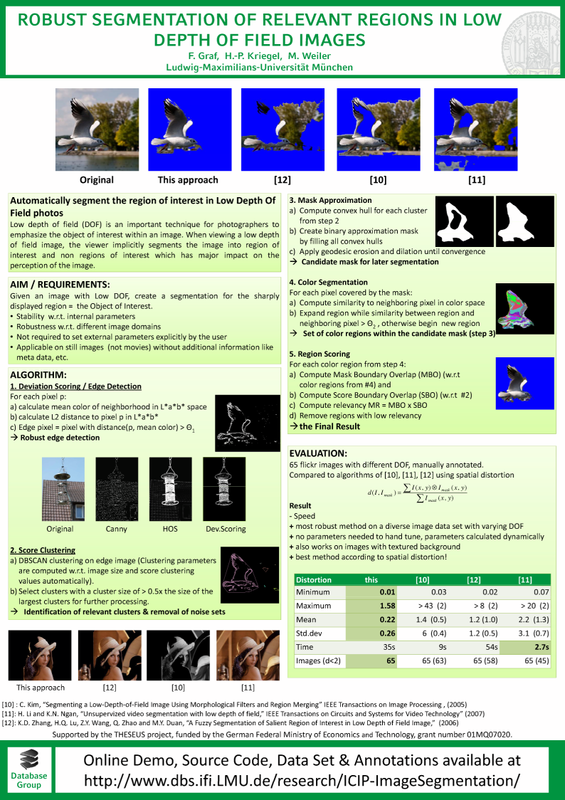 We extended his Diploma thesis and produced an improved segmentation algorithm for Low Depth Of Field images. Compared to the other 3 competing algorithms, ours is a bit slower but at least it works. The other algorithms turned out to be extremely unstable and/or sensitive to parameters. 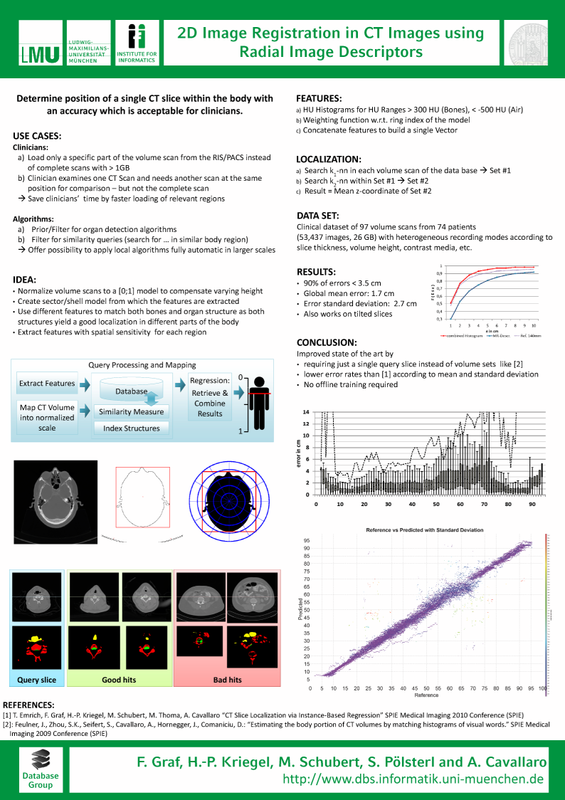 Yea finally I gave the talk for my Publication “Fully automatic detection of the vertebrae in 2D CT images” Paper 7962-11 at SPIE Medical Imaging 2011, Conference 7962 Image Processing (see index) in front of about 200 people. Knowledge about the vertebrae is a valuable source of information for several annotation tasks. In recent years, the research community spent a considerable effort for detecting, segmenting and analyzing the vertebrae and the spine in various image modalities like CT or MR. Most of these methods rely on prior knowledge like the location of the vertebrae or other initial information like the manual detection of the spine. Furthermore, the majority of these methods require a complete volume scan. With the existence of use cases where only a single slice is available, there arises a demand for methods allowing the detection of the vertebrae in 2D images. In this paper, we propose a fully automatic and parameterless algorithm for detecting the vertebrae in 2D CT images. Our algorithm starts with detecting candidate locations by taking the density of bone-like structures into account. Afterwards, the candidate locations are extended into candidate regions for which certain image features are extracted. The resulting feature vectors are compared to a sample set of previously annotated and processed images in order to determine the best candidate region. In a final step, the result region is readjusted until convergence to a locally optimal position. Our new method is validated on a real world data set of more than 9 329 images of 34 patients being annotated by a clinician in order to provide a realistic ground truth. More Information and the paper as PDF can be found at my publication site.